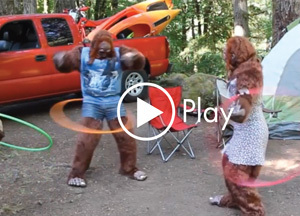 A family of Sasquatch enjoy camping and hula hoops after purchasing their Discover Pass. The Washington State Department of Natural Resources (DNR) launched a video campaign featuring a Sasquatch family to remind people that a Discover Pass is required when visiting Washington state-managed recreation lands. The Discover Pass is a vehicle access pass required on all Washington state-managed recreation lands. The fine for not displaying a Discover Pass is $99. An annual pass costs $35 and a one-day pass is $11.50 (including transaction fees). The Washington State Discover Pass is required for vehicle access to recreation lands and water-access sites managed by the Washington State Parks and Recreation Commission, DNR, and Washington Department of Fish and Wildlife (WDFW). State recreation lands include state parks, boat launches, heritage sites, wildlife and natural areas, trails, and trailheads. For more information, visit www.discoverpass.wa.gov.